Mondriaan: Shows beautiful color combinations! Have you ever been jealous on artists and home decorators who create the most beautiful color combinations? Here is a program to assist you in doing the same!. Mondriaan shows color panes, that keep changing colors. Fine compination can be saved. It runs under Windows 95/98/00/NT/XP. Mondriaan can be freely downloaded. Mondriaan is bi-lingual. The help pages too. 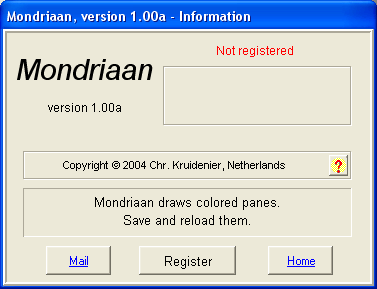 If you are using a Dutch version of Windows, then Mondriaan is Dutch too. Otherwise Mondriaan speaks English. Mondriaan hase a context sensitive help system. Configure the time interval between two color combinations. Save beautiful combinations for later use. Put Mondriaan into the Full Screen mode. Freeze the current color combination. Hide the title bar so only the color panes will be visible. Click the "Pause" button to enter the Pause mode en freeze the current color pattern. After reading a saved pattern Mondriaan is in the Pause mode. Click the "Coninue" buton to continue changing colors. Click the "Read Pattern" button to read a saved pattern. So you can study your finest color combinations. Click the "Save Pattern" button to save the current pattern. Later on you can read the saved pattern for a closer look. "Number of Panes horizontal"; This is the number of panes in horizontal direction. "Number of Panes vertical"; This is the number of panes in vertical direction. "Time Interval"; This is the amount of time between two color changes. "Screen"; Check "Hide Title Bar" to hide the title bar and see only the color panes. 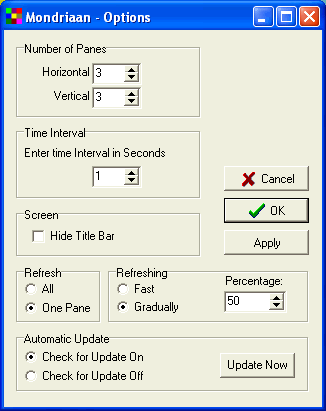 "Refresh"; Check "One Pane" to change the colors pane by pane. 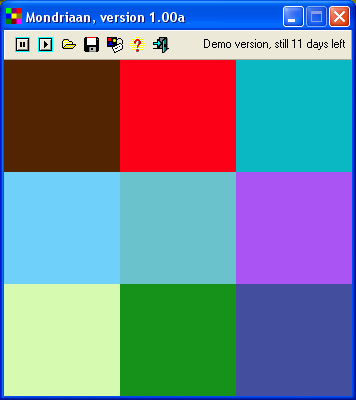 "Refreshing"; Check "Gradually" in the "One Pane" mode to to gradually change the color of a pane from the current color to the next one. "Percentage". Enter 100 to obtain the slowest change of color. "Automatic Update". Check "Automatic Updates On" to let Mondriaan check if a new version is available. "Help Index" - Click this item, for the Help Index. "About" - Click this item for information about the program and the author. Click the "Author" button for the address data of the Author of the program. Click the "Quit" button to close the program. The configuration will be saved. Mondriaan freely available. Remarks, bugs or suggestions for improvement are welcome by e-mail. Give the program to your friends! You can try the program without any risc; It can be easily removed again from your computer ("Start | Configuration Screen | Software | Mondriaan" => Click the button "Remove"). Click "OK" and downloading starts. The file " mondriaan110.exe" wil now be saved to the directory "c:\Temp"
Now follow the directions in the setup program to install Mondriaan on your computer.